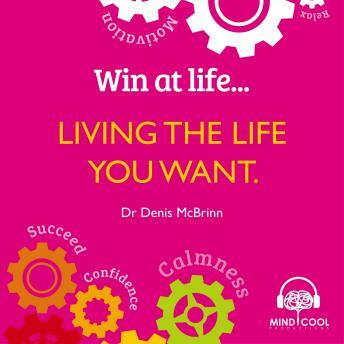 The aim of this Win at Life programme is to empower you to take practical steps along the road to Living the Life you want, starting today. All of us are capable of making positive changes in our lives, but often fear; our own limiting beliefs about ourselves and what others might say, holds us back from living the life we truly want and deserve. A basic human need is to grow and achieve at some level in our lives. But why is it some people appear to attain higher levels of achievement than others? Are they born that way? Is it just luck or are there some underlying principles behind success that anyone can apply to become more effective and fulfilled in any area of life? Studies of highly effective and successful people conclude that success is 80% attitudinal behaviours that can be learned and developed. The other 20% is down to the natural ability we are born with. Whilst the natural abilities we inherit in our DNA are important, it appears to account for only 20% of achievement. Psychologists conclude that what is much more significant are those attitudinal behaviours that high achievers have learned to do consistently. They have developed certain habits of behaviour, relating to the way they think and act, that is resulting in their higher than average levels of success, more than natural ability. The conclusions from the studies are that nurture is more important that nature. Therefore, irrespective of our natural ability, we can do the same to get more out of our lives just by changing the way we think and feel about ourselves and situations. The audiobook will cover the following areas: Empowering Personal Change, Formula for Success, Great Physical Health, Sound Mental Wellbeing, Your Inner Life, Managing your Finances, Success at Work, Relationships, Personal Growth, Rest and Relaxation, and Making it Happen!